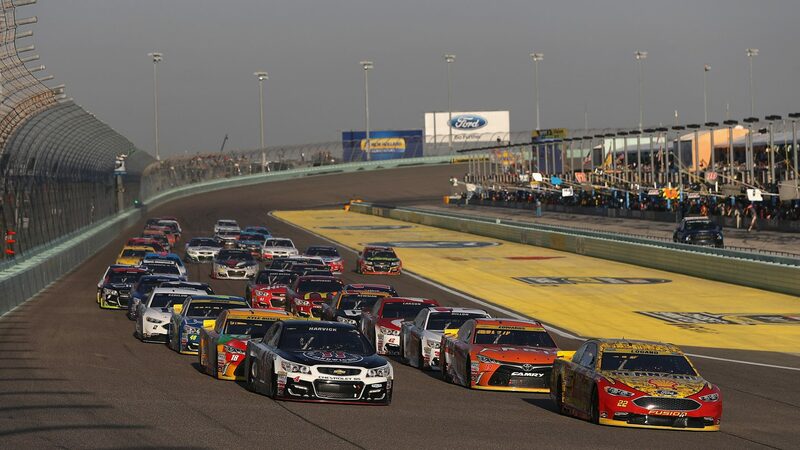 NASCAR will this weekend travel to Homestead, Florida, for a tripleheader at Homestead-Miami Speedway. NASCAR Camping World Truck Series, Xfinity Series and Monster Energy NASCAR Cup Series will all race this championship weekend. Homestead-Miami Speedway opened for racing in 1995. The track is an oval and is 2.4 km (1.5 mile) long. Surface is asphalt with four turns. Banking in turns 18-20°, banking in straits 4°. Track record, for NASCAR Series, is held by Brad Keselowski with 181.238 mph (29.816 sec.) during qualifying (2014). Most wins by an active driver at Homestead-Miami Speedway is Denny Hamlin (13 races) with 2 wins. The stands currently capacity are 65 000 seats. Bonus facts. Worst Starting Spot to Win: Denny Hamlin, 2009, started 38th.